Do you want to know how to play the game Reversi? LTK Board Games is here to help. Englishman Lewis Waterman and John W. Mollett originally created Reversi in 1880. It was then published in 1898 by the Ravenberger Company as one of its first titles. The name of the game was changed to Othello in 1975. Othello was then introduced to Hong Kong in the 80's as a promotional item to "Apple Jeans". However, the board was in yellow with red and green chips, in contrast to the standard green board that has black and white chips. Today, the Mattel Toy Company produces the game. Reversi is played on an 8x8 inch grid board. 64 chips are distributed equally between two players. Each chip is two-colored (usually black and white) and each participant chooses which color they will play. The board is then set up by placing four chips in the center four squares. The top left and bottom right hand chips are flipped to their white face. Then the top right and bottom left chips are flipped to the black side. To begin the game, the player with the black chips goes first. During each player's turn, a chip must be placed in a way where an opponent's piece can be captured. To do so, the chip must be in an empty space adjacent to at least one chip of the other player and have another one of your own chips already in place on the other side of the opponent's chip. Any chips in between the chip you set down are then flipped to your color and captured. Depending on the placement of your chip, you can sometimes capture multiple opponents' chips from different directions (horizontal, vertical or diagonal). It is good to note that once you have placed your chip on the board and is played, it cannot be moved to another location on any future turns during the game. The game ends when both players cannot make any additional moves. This usually means that the board is full of chips. To win you need to have the majority of the pieces in your color by the end of the game. This game involves a bit of strategy. Use the following tips to help you play the game Reversi better and gain the edge to win. The four corners of the board are the most valuable spaces since they are incapable of being captured. Use this to your advantage, and try to your piece into these spots towards the end of the game for the best capturing position. Early in the game, try not to capture too many of your opponent's pieces. Lean towards more aggressive play towards the end of the game. Try to reduce the number of legal moves your opponent can make. By doing this, you will force your opponent to make a move that is undesirable to them, by advantageous for you. Keep your pieces grouped together in the center of the board for the most mobility in play and limits your opponent's moves. 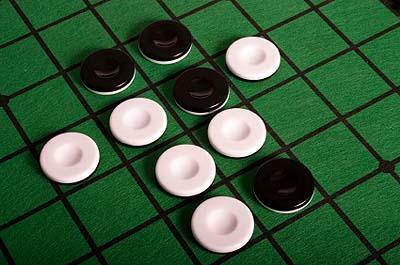 If you want to play the game Reversi, a little strategy and forethought is required. Although it is a simple game to learn, like chess or checkers, you need to think about the possible moves your opponent could make can give you a better advantage.